You are wise to search for hiking boots reviews in your quest for safe and enjoyable trail time. Do I really need to add more painful examples to convince you that you need the best womens hiking boots you can buy on your feet? This page gives you a strategy for using boot reviews to find eligible pairs, and then tips on how to go shopping for hiking boots. Want Hiking For Her boot reviews instead? If you'd rather read about trail shoes, go here. If you're committed to putting the absolute best fitting pair of hiking boots (a category which can include hiking shoes and hiking sandals as well) on your feet, read on! There are lots of places to make mistakes with womens hiking boots, and you want to avoid them to quickly locate the best pair for your feet, your terrain, and your ambitions as a hiker. And gear reviews are going to help you do that. You and I both agree that we want the very best hiking boots on your feet. But we need to be realistic. So I'd like to pass along an approach I use when it's time for new boots (and the way I hike, that's almost every year or two). This strategy guarantees that I don't miss anything, and maximizes my chances of getting the perfect fit, when I read hiking boots reviews. I'm confident that it will work for you, too. I'm assuming you're looking for the best lightweight hiking boots, with minimal break in time, you can find. If you want old school leather boots with heavy soles for rugged adventures, contact me for some brands to try. It's going to take four steps to find your perfect hiking boots. As champion shoppers, women tend to know the foibles of their feet. Using myself as an example, I have wickedly wide feet with a high arch. This anatomical "gift" from my father's side of the family severely limits my boot options. What are your feet like? Sit on the floor and turn your bare feet toward each other, with heels, soles and toes touching. Put your right index finger into the "gap" where the empty space exists. If there's a gap large enough to wiggle your finger in a circle, you have a high arch. No wiggle room? Not much of an arch. Pick up a pair of shoes that you wear frequently for work or school. Put them together and look at the heels. Is the wear and tear equal, or is one side more worn down than the other? Examine the edges of your feet, from toes to heel, for calluses and signs of pressure points. Maybe your current shoes/boots are too tight and you'll need a half size up. Now you have a realistic view of what you're putting into a hiking boot. Know that certain boot manufacturers specialize, or not, in your exact type of foot. Assess the type of hiking you're going to be doing. You don't want an "overbuilt" boot that you're going to pay a lot for you - unless you plan on rocky trails that require great grip and arch protection. On the other hand, you might want a waterproof boot if you're hiking in the Pacific Northwest but can wear lightweight, water resistant boots in an arid climate. Pay attention to the features that matter most to you, and put those at the top of your list when you start to look at hiking boots with a serious commitment to finding the perfect pair for your feet. Are fashionable looks important to you in hiking boots? Do you mind replacing your footwear frequently? Or is durability important to you? Use this list of boot features when it's finally time to take the next step. Your mission: Leave no stone unturned. By that I mean it's time to harness the power of electrons (a.k.a. The Internet) to read what other hikers are saying in hiking boots reviews. Outdoor Gear Lab is the place to start. Just for the record, I have no affiliation with Outdoor Gear Lab. I'm just grateful for the (Hiking Pun Alert) leg work they do on my behalf. They really dig into the nitty gritty of the performance aspects of boots: traction for example. If you're hiking on gnarly trails, or plan to, you want a boot that stands up for you against rocks and roots, right? 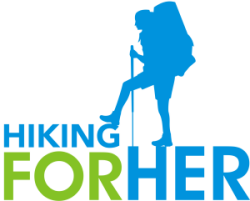 They give background information to help you make a decision between women's hiking boots and hiking shoes. This puts you in a position of strength when it comes time to part with your hard earned money. I recommend taking notes, or creating a shopping "cheat sheet" of brands and boot names as you read so your eyes don't glaze over. Don't bypass their "price versus value" comparison charts. These will give you a feel for how much money you're willing to spend to achieve your hiking boots goals from Step Two. Many folks ask me about the hiking boots reviews that are done in hiking magazines. Take a look at the ad placements. Scan the photos in the ads - do you see yourself doing that type of outdoor activity? Is the demographic represented in each ad a good snapshot of you? Personally I avoid looking at those glossy ads because I seriously doubt whether the person creating them has ever worn a pair of hiking boots for any length of time, let alone selected the best hiking boots for his/her feet. However, it does give you a glimpse of the newest, and best selling, hiking boots. So it can be a useful place to start your research. Unfortunately, reading reviews can only take you so far on your search for the best hiking boots to accompany you on your hiking adventures. 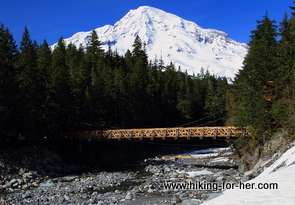 And so we cross the bridge to another step in hiking boots reviews... getting real boots. Cross over from guessing which pair of hiking boots is best, to using hiking boots reviews! Now that your head is swimming (or brimming, if you're a glass half full kinda woman) with hiking boots data, apply that information to a field trip into your nearest "real" gear store. If you need to do more background reading, here it is. You want to bring your favorite high performance socks with you, too. Don't rely on the grab bag of mismatched socks which gear stores provide for you, or use your thin everyday socks. Don't have a favorite sock brand yet? Read this. Be patient with yourself during this step of your boot quest. Here's where it's getting really real. Make sure your blood sugar level is on an even keel: eat a snack before you hit the boot department. Don't put time pressures on yourself by scheduling something major that day. Vow to keep focused on the cheat sheets you brought along: your unique footsie issues, the type of hiking you're planning, and your price -vs- quality analysis. Don't neglect to ouse your hiking boots reviews data! Fight the urge to be defeated by the sizing numbers. True story: In my twenties, I wore a size 5 shoe. Today, I wear a size 9 hiking boot. Incredible, isn't it?? Keep an open mind and try on lots of different brands of hiking boots. Only you can tell when you've identified a winner for your feet. Ask the salesperson which brands run small, cater to wide or narrow feet, are great for day hikes versus carrying loads while backpacking ... all the stuff you worked hard to identify in the previous steps. It's finally time to select a pair of hiking boots. It's a big commitment, I know. You're going to be spending a lot of time with these boots, hiking through thick and thin, and you have high hopes (sort of like selecting a mate). If you shop with a reliable company like REI, you can exchange (and sometimes even return) boots that don't work out. A break-in period is necessary for your feet to adjust and mold the boots. Stiff leather boots will require the longest period of time to feel comfortable. Some of the lightweight hiking boots don't need more than a few minutes to feel great! Please don't rush to judgement after just one hike. It might be a sock issue, or how you lace the boots. These can be easily adjusted. You might (will, in my opinion) need more than one type of boot if you hike a wide range of terrain, and are on the trail through multiple seasons of the year. Or maybe hiking shoes are the solution - repeat all of the steps but look at trail shoes rather than boots. You need a personal gear chat with me! Schedule a convenient time to ponder the merits of different types of boots - or trail shoes. We can go virtual shopping together, too. Finding the perfect pair of womens hiking boots is a lot more fun when you have a buddy.